This paper presents an iterative algorithm for inversion of X-ray signals. The objective of this work is to estimate parameters characterising pipe wall thickness, based on information contained in the measured X-ray projections. The approach uses the simplified code to model the physical process of material-radiation interaction and modified multistage simplex minimisation method. The parameters of the forward model are updated using an iterative scheme that minimises the sum of the squared errors between the measured and model predicted signals. The error function is minimised by updating the pipe wall profile parameters. The modified simplex minimisation method is used to arrive at the minimum in the multi-dimensional search space. Simulation results, obtained using real test geometry, demonstrate the effectiveness of the approach. A high degree of automation enables the application of stationary radiological testing for routine inspections. Such automated systems can be successfully used for the stationary inspection of pipe welds in industrial plants. This pre-service and in-service mobile inspection of pipes are a growing field for usage of such mechanised X-ray systems with comprehensive numerical image analysis including automated crack detection scheme. A mobile digital radiography system was developed and tested for in-field inspection at BAM (Berlin, Germany) . The equipment consists of a high sensitive photo diode line camera, a light manipulator, and a 225 kV X-ray tube (Figure 1). This system is designed to scan circumferential pipe welds with a scan width up to 100 mm in the axial direction. The pixel resolution is 50 µm with 2048 pixels per line. The camera and tube are supported 180o apart and rotate together around the pipe to acquire images line by line. The X-ray tube is shifted in the direction to the pipe axis step by step (two - four hundred positions along 250 mm line). In contrast to the X-ray tube the line camera is not shifted. The technique of line scanning yields some advantages, first of all the radiation direction corresponds to the central projection technique, which always employs only radial penetration. Thus radially orientated cracks can be detected with maximum available contrast. The slit collimator of the line camera significantly reduces the scattered radiation in the obtained images. The mechanism of this system allows the adjustment of the radiation direction for inspection of weld on side wall pipe with high sensitivity (Figure 2). Scanning the weld at different angles provides multiple projections, which improve the probability of detection for laminar flaws such as cracks and lack of fusion. The estimation of the depth and shape of such laminar cracks is become possible. The reconstruction of crack parameters in welds using X-ray projections is connected with some features, which may corrupt the final images. First, the crack appearance in the weld is frequently hidden by the images of other defects like undercuts, lack of fusion, etc. Second, it can be observed that radiographic images also have a combination of three unwanted features: background trends, geometrical structures and noise . All these image features possess characteristics similar to that of a crack and make it difficult for automated crack detection Figure 1. 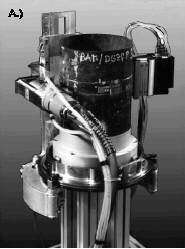 Computerised radiography system with X-ray source, line camera and manipulator Figure 2. Scheme of X-ray image formation for welded pipe wall profiles routines to discriminate between cracks and these other features in an arbitrary image. Therefore, we propose that the effects of these unwanted image features can be reduced in such a way that accurate and reliable feature discrimination can take place. Thus, for accurate analysis of X-ray images of pipe structures involving welding with crack, it is often necessary to characterise the profiles of two pipe walls. Clearly, the conventional analysis of images is made difficult owing to some functioning characteristics of radiographic equipment, to the individual pipe structure geometry and the differences of absorption in materials. The improvement in this profile evaluation can be done through a better knowledge of each element of the data acquisition system and the modelling of interactions between X-rays and inspected structures. The operations of radiography, shifting the X-ray tube, digitisation and calibration allow obtaining an unidirectional image of the inspected structure. We have built a mathematical model of this function taking into account all this steps in the data line acquisition system. Considering the construction of the measuring system, a numerical model for the X-ray projection process was developed where the X-ray beam and material interaction is described as a simplified transport process . Our approach is to repetitively solve the forward problem with iterated model input until the solution agrees with the experimental data. We initialise the problem by the definition of a model with ideal profile parameters for inner and outer surfaces of top and bottom pipe walls. This initial profile is derived from the known pipe diameter and wall thickness. Then, we calculate the X-ray projections using an appropriate model for the wall penetration by radiation. The variation of the profiles is calculated under minimisation of the root mean square of the measured and calculated projections. This iteration process provides basically the surface profiles of the pipe walls. The kernel of the numerical process is defined by two key procedures. Those are using a computationally effective model for solving the forward problem, and using a reliable optimisation algorithm for updating the model. Iterating the model randomly could easily cause the solution to converge to a relative minimum. To assume the convergence to a global minimum we used a modification technique for a simplex minimisation algorithm. In searching for the minimum of the objective function, zero-order methods require only functional values in their operation. The most significant advantage is that these methods are simple to formulate and easy to implement. This is especially the case when it is difficult (time consuming) to calculate the first or second derivatives of the objective function. test the convergence according to the standard deviation of the K function values or the maximum distance between points; if convergence criterion is not met, repeat the process again; if met - stop the process. The simplex method is a straightforward and very fast search method, which can be applied to a wide range of constrained minimisation problems. This conventional simplex minimisation algorithm decreases the objective function at each iteration. Therefore, it can converge only towards the local minimum the closest from the chosen starting point. It means that if the function is convex, this local minimum corresponds to the global minimum. In the opposite case, the function can show numerous local minimum very far from the global minimum. Some first numerical experiments with solving our problem showed that the objective function can have several local minimums. In order to avoid this difficulty, it is necessary to use a modification to this algorithm which authorises time to time to cross the "passes" of the objective function, and comes down towards minimum of better quality. For this, we define at random a several (eight to twelve) trials to find minimum corresponding to different initial starting points (profile parameters). The algorithm converges towards a local minimum, each time of different quality. Then it is selected the best result (that means close to the global minimum) and searching is continued. Sometimes, it can be slow to converge at the end of the processing. To solve the problem, it is terminated with some iterations of the gradient based method. This algorithm was put in a code, and it has a quite good robustness. The proposed method was applied to both, simulated and experimentally obtained data. 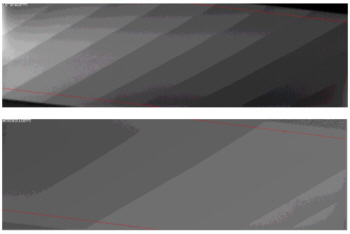 The software was first validated on a step-wedge sample containing ten steps of 1 mm (Figure 3). The comparison between experimental and predicted radiation images for the best set of parameters is given in Figure 4. The agreement between the two images is very good, and confirms that the model is able to predict key parts of the phenomena encountered in the measurement. The second experiment included an inspection of a real welded pipe. The reconstructed pipe wall profiles (Figure 5) are in very good agreement with independent characterisation of these profiles. Pipe profiles have been calculated by the inversion of X-ray data. In the calculations, the direct problem is solved numerically to obtain predictions of images. An error function is constructed quantifying the overall difference between predictions and measurements. The pipe wall profiles are found by minimising the error function using modified multistage simplex minimisation method. The modified simplex optimisation algorithm was shown to provide a flexible approach to the reconstruction of pipe wall profiles, enabling parameters of the profile to be traded in a straightforward manner. An advantage of the modification used in this approach was the ability to escape from local minimum in an attempt to locate the global minimum of a defined error function. Clearly, the inversion is limited to the range of material parameters in which the solution of the direct problem is valid. For inspection of inner cracks the procedure will be combined with other reconstruction techniques.